Some time last year I was walking down my local shops looking to add yet more books to my ever-expanding collection that is growing by the week. I know now that I will have to speed up my reading if I am to keep up with my addiction or stop buying books so I can catch up (the latter is not an option). Sadly where I reside at the present there are no proper local bookshops, just a struggling Waterstones, a Works, a WHSmiths and the dreaded killer of all things local; the supermarket. Between them and Amazon it is only a matter of time but not as long as I draw breath on this revolving rock we live on! Anyway, out of the corner of my eye I caught this blue book cover calling to me. I recognised the area on the front, noticing it was the Athens of the North, the beautiful Edinburgh. Now I’m not a city person but I do love Edinburgh; coming back from there myself just over three weeks ago. It is a paradise for a writer and anyone creative as well as damn good pubs! I want to go back, move there for a while or up to the Highlands and islands away from my drab, grey little dead town. So I picked up the book and read the blurb on the back. It sounded like a Phil Rickman style story, a writer who uses elements of the supernatural in his crime fiction, like Midsomer Murders on LSD; and I was already hooked before starting the first chapter. This though was different. It was grittier and darker than Rickman’s quirkier and eccentric tales. Edinburgh is the central character really with James Oswald‘s hero Inspector Tony McLean inhabiting the life-force that is this incredible city. It starts off with a murder and the hero juggles many cases whilst trying to solve a sixty-year old murder in an abandoned house in the city. 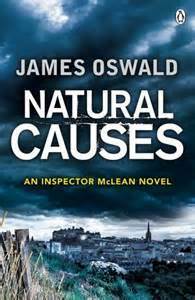 He is hassled relentlessly by his boss, Chief Inspector Charles Duguid who doesn’t like McLean at all, probably because he solves cases better than him? The supernatural element of the story has been done similarly before but is handles brilliantly and effortlessly here to great satisfaction. The end was cleared up nicely; about the only way it could go really although I did find myself questioning it. You will have to read to find out why. The body count racks up nicely as the manner in which they are killed. There are a few shocks, twists and turns in here to keep the pages flying. The chapters are short and sweet, all having hooks at the beginning and end to keep the reader turning those pages. I lost a whole day reading whilst I was meant to be studying and writing myself! James Oswald, Farmer and writer with a few friends. I had already bought the follow-up, The Book of Souls (Book 2) and the Hangman’s Song (Book 3) on the strength of the blurb of the first one. I am reading Book 2 now, 107 pages in on chapter twenty. The fourth in the series, Dead Men’s Bones looks set for early July according to his Amazon (support your local bookshop if you can) page so I should be caught up by then with any luck. So what do I think then of Natural Causes and the follow-up so far? I simply love them. The characters are strong and believable (in fact I think I know one or two especially Grumpy Bob) who you either support or want them to fail. James Oswald has a new fan in me and I will devour all his work from now on. As for Inspector McLean, it will only be a matter of time before he is on our TV screens with any luck. They’re too good stories not to be. As for McLean himself, I would go for a drink with him even if he disappears all the time solving crimes. 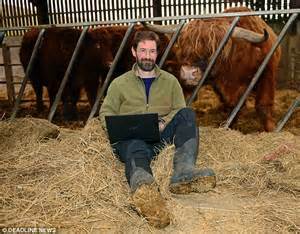 He is also the author of the Ballad of Sir Benfro series of fantasy books that many will be interested in, including me. Do yourself a favour and pick up Natural Causes, read and enjoy.